Spring TX is a great Houston suburb with plenty of shopping, dining, and nature options for its residents, including the gorgeous twenty five acre Spring Creek Greenway and the TGR Exotic Wildlife Park. We bring the most beautiful custom stained glass to the residents of Spring, TX. We create residential, commercial and religious stained glass and work one on one with clients to ensure that each piece meets their needs, their tastes, and complements and enhances the space it will be installed into. Our residential clients enjoy stained glass of many different styles. We work with them to come up with the designs and glass choices that will elevate their décor, provide a focal point or wow factor, and ensure they will never grow tired of their stained glass windows. Stained glass can take a ho-hum generic entry and turn it into a show stopper. It can take an ordinary master bathroom and turn it into a room with real elegance and class. Stained glass adds incredible beauty, light, and style to any room. It adds value to a home while it also can add much needed privacy, along with great beauty, of course. We work in any styles our clients like, from antique style to something more contemporary. Our designers are well versed in Art Deco, Art Nouveau, Celtic styles, Mission designs, the work of famed architects and stained glass designers Frank Lloyd Wright, Charles Rennie Mackintosh, and Greene and Greene, among others. Stained glass is a traditional art form that has become closely associated with churches and other houses of worship over the past centuries. We work together with Spring TX churches, chapels (including home chapels), cathedrals, temples, and more, to create beautiful and inspirational works of art. These can be traditional, featuring saints, icons, or scenes from the Holy Bible, or they can be more modern with different types of images such as the dove which symbolizes peace. We are also honored to offer repair and full restoration services for older or damaged stained glass. Over our two decades in business we have developed special processes that restore antique stained glass to its original glory. We can also restore it to have greater structural integrity and re-install it in such a way that it will last another century or more without sagging or bowing. 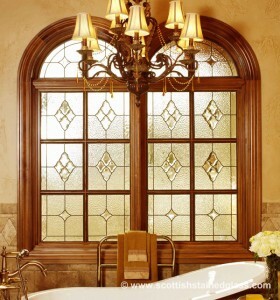 Our company has been creating beautiful stained glass designs and delighted customers for over twenty years. With an A+ rating from the Better Business Bureau and a commitment to high quality craftsmanship and equally high quality customer service, we hope we can earn your business.